Some structures can settle over time due to poor soil conditions, groundwater problems or undersized footings. 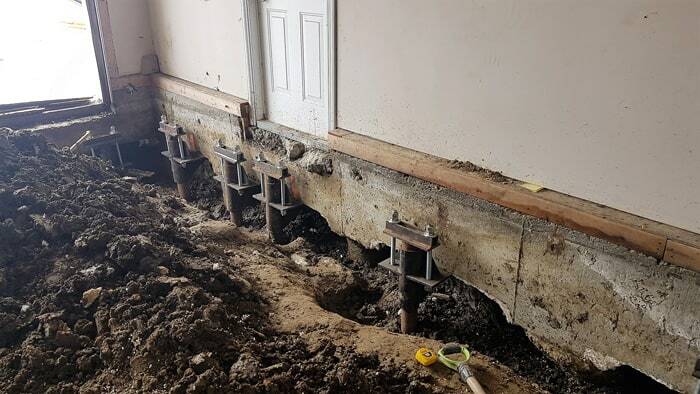 To correct this, we need to place piles under the foundation that extend down to suitable soil conditions able to support the weight of the structure. For our piling work, we partner with Apollo Piling. We take care of the excavating, concrete removal and repair, waterproofing and site restoration while Apollo takes care of the piling and engineering. Once the piles are installed, lifting heads that extend under the foundation are attached to the piles. The entire structure can then be jacked up and secured in place. All our repairs are permitted, engineered and guaranteed. While we typically use screw piles for most applications, here are descriptions of the three principal types of piles used in this type of failure. 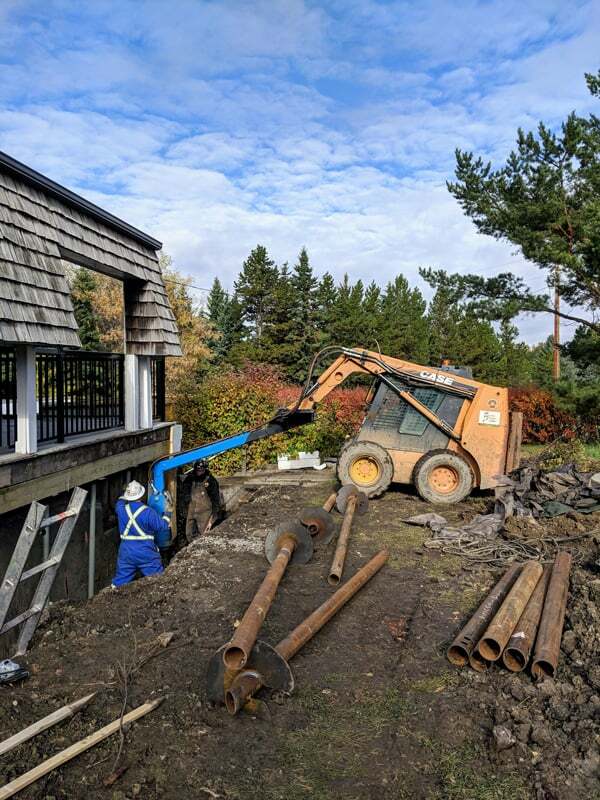 What Are Helical Piles in Edmonton? Also known as helical piles. These screw piles are twisted into the ground to a predetermined torque. There is a formula using this torque number, the area of the helix blade at the end of the helical pile, and the thickness and strength of the steel are used to come up with the load-bearing capacity of the helical pile. The soil conditions can affect the depth of the screw pile needed, but they are quickly installed so the extra depth is not that expensive. Soil tests are not necessary for screw piles either as the have to be driven down until the predetermined torque level is achieved, whether you know what the depth ahead of time or not. Screw piles are considered an end bearing pile but the end is 14 to 20 inches in diameter so the required load-bearing capacity is reached at a shallower depth than jack piles. Screw piles cover the middle ground as far as costs go. These are usually the cheapest and most common and are used extensively on new construction. Concrete piles are considered friction piles with some end bearing capacity. Friction piles get much of their load-bearing capacity from contact with the soil against the surfaces of the concrete. A lot of failures with concrete piles occur in very dry years when the soil shrinks away from the pile. This reduces the load carrying capacity and can cause the structure to sink. To be sure a concrete pile is designed properly for any given site, the soil conditions need to be known. Core tests should be taken to determine soil type. We see a lot of failed concrete piles, usually due to inadequate depth or diameter for the soil conditions. Also known as push piles. This type of pile is pressed hydraulically into the ground using the weight of the structure as a counter. They are primarily an end bearing pile. The advantage of jack piles is that they can be used in very tight locations. However, they are more expensive to install because the lengths of pipe used are usually only two to three feet, requiring the need for a lot of welding or more expensive threaded pipe and collars. In addition, the jack piles are only about 3 inches in diameter meaning they have to go much deeper in the ground to get the support needed. The piles are pushed into the ground until refusal; that is when the structure starts to come up. 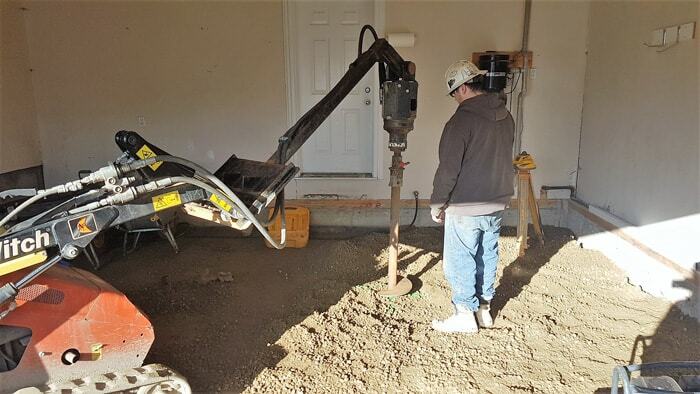 Soil testing is not required because the piles are driven to whatever depth is needed for the structure to lift. When space is a premium, jack piles are sometimes the only choice.